“China remains clumsy in so many ways” was my reaction when I opened up the main page of a major Chinese news portal site a few days ago. There was yet again another deadly coal mine explosion which saw 106 souls perishing helplessly. The newly-built Hangzhou Bay Bridge was hit by a South Korean tanker and experts were assessing the damage and perhaps potential flaws in design. The recurring theme seems to be somewhere in China someone screwed up again. These days the Chinese media, especially their online outlets are increasingly appearing like their western counterpart, at least on the surface. We are pampered with news that of someone screwed up almost daily. This though, is a testament to the progress China has made, that China has become more open and more liberal. This would not have been possible just merely ten years ago. Nevertheless the message is loud and clear: China is still clumsy in many ways. The DPRK offered its condolences to China over the Heilongjiang coal mine explosion. I can picture the Dear Leader and the KWP cadres having a moment of schadenfreude: See? You guys have completely ditched your morals and gone totally capitalistic, this is the price you pay. You boast that you are the third biggest economy and yet you keep on having these explosions, like one every several months? This would never happen in our Workers’ Paradise. And can you blame the Dear Leader for feeling a bit contemptuous? This kind of “accidents” did not happen in China when Chairman Mao was manning the helm. Nowadays everyone is so fixated on money, quantity over quality, short-term gains and quick money are favored over long-term benefits. In the spirit of “빨리 빨리!”(funny that the Koreans still tend to think of the Chinese as people who move at a snail’s pace) shoddy buildings were erected and shabby mines dug without any attention paid to safety, quality and the environment. It makes me seriously wonder whether the Chinese are really forward-looking people with a clear vision and long-term goals. Do they know what they are doing? And that probably explains why there is yet to be any world-renowned brand name coming out of China. That probably also explains why China Inc. and Chinese-made products have been having a tough time in not only the West but also in the developing world. That probably explains why tensions are high in some African countries regarding certain practices by the Chinese companies. And ultimately that probably explains why China’s image overseas has been far from positive and appealing. In a nutshell it is all tied to the clumsy China and the short-sighted Chinese. 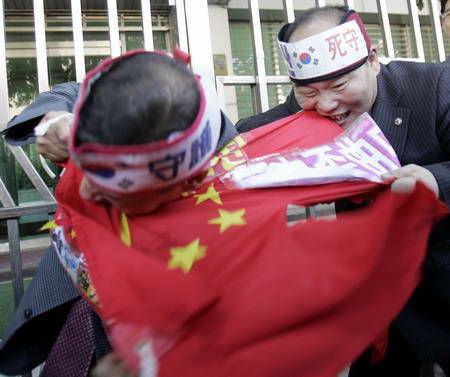 Speaking of China who can be really clumsy, a Chinese Korea scholar was blaming the alarmist and xenophobic sentiment the South Koreans have toward things Chinese and Japanese for the lack of Chinese Wave in South Korea. It is a very thought-provoking article that has made some good points. His argument is certainly not without merits, however he missed the mark by 3000 li in my opinion. Why is there no Chinese Wave like the Korean Wave that has swept much of East Asia and Southeast Asia in South Korea? Because most South Koreans simply don’t find the contemporary Chinese culture appealing enough. And why is that? Probably because the South Koreans don’t find the country behind it, China very appealing. Why? Because contemporary China is perceived as a still very much backward, communist/socialist authoritarian state that is not yet capable of producing a popular culture that foreigners are attracted to. Simply put, China today is not a trend setter but a trend follower. Not yet. I will tell you when there will be a Chinese Wave in South Korea and elsewhere: The day when the Chinese stop coming up with some cheesy f0reign-sounding brand names such as “Youngor” and when Chinese kids stop introducing themselves with “Please call me Daniel/Vivian..”. Oh boy, China has a long way to go. One of my students used ‘Youngor’ as his English name. Others were less imaginitive. What the hell’s up with that last photo? Bizarre stuff. Was this really you writing, Juche? I thought you’d asked Stuart to do a guest post! I find it a bit difficult sometimes to gauge whether you’re being ironic. I do hope you weren’t serious when you said things like these mine accidents didn’t happen under Mao. Of course they did. They just didn’t get reported much, if at all – either inside or outside of China. It’s the lack of accountability or supervision that makes safety standards so abysmal in China. I think we’ve rather got the worst of both worlds here now: capitalist greed and callousness combined with the inept management and quality control practices (and greed and callousness…. and corruption) of communist government. I thought about that when I wrote the above piece. Of course terrible things happened in those years but I don’t consider them the same. There was rush for everything in the old days and people took their time to take care of proper business. I remember my parents telling me that stuff made in those years were much sturdier and better (quality wise) than some of the stuff made nowadays. There was no San Lu fiasco. There was no water-filled pork back then. I wouldn’t be completely confident of that, Juche. There’s a tendency to view the past with rose-tinted spectacles. The urge to cut corners and disregard public health can be engendered as much by arbitrarily imposed production targets as by a pure profit motive. The quality of some consumer products may perhaps have been higher back then, but we were talking of industrial accidents – and I suspect the record there was as bad or worse than today. China had the highest rate of dam failures in the world back then, I understand – but it didn’t become widely known until later. Highest rate of dam failures back then? When? It’s a long time ago I read that, and I don’t recall what the specific timeframe was – I think probably the 1960s. Of course, losing 62 dams in one day in the Banqiao disaster in ’75 wouldn’t have helped the average; but I think I’ve read that the rate of failures was extremely high in the 50s and 60s, and continued to be so into the 70s and 80s. I don’t know if it’s that much better today.